Amy Warren has trained for the trip of a lifetime, hiking the Grand Canyon on the rim-to-rim backpacking trail. Her husband of twenty-nine years leaves her a note on the morning of her departure saying that he is divorcing her and that she’d fail on her adventure. Doubts fill Amy’s mind and when the friend who was supposed to accompany her gets injured and can’t come, she thinks about turning back. But then she meets Sarah Rochon in the airport as Sarah helps her wrestle her bag from a thief. The two decide to make the hike together. 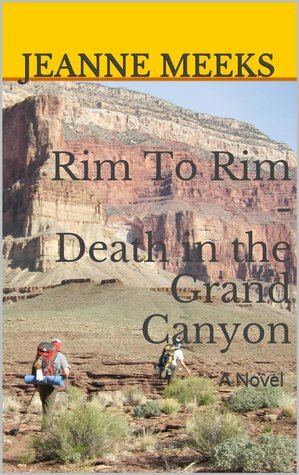 This is an action-packed mystery with lots of information about the Grand Canyon and backpacking. I found it absolutely spell-binding both in plot and in scenery. Jeanne Meeks makes her readers feel as if they are hiking up and down the trail right along with Amy and Sarah. Both women are fully defined characters and I really liked them. I especially enjoyed seeing Amy gain confidence as she battles hurdle after hurdle. The two women have to conquer not only all the rigors of the trail and the mishaps along the way, but they are also being pursued by a murderous drug dealer. Mystery lovers, especially those who like strong woman characters, are sure to enjoy Rim-to-Rim.